Please follow the links below to find an answer to your question. If your question is not included, please do not hesitate to contact the conference team. Please check the schedule and the conference programme at http://eadi-nordic2017.org/category/schedule/. What is the purpose of the EADI NORDIC 2017 Conference? The conference is a joint partnership between EADI (European Association of Development Research and Training Institutes), NFU (Norwegian Association of Development Research) and the University of Bergen (UiB). The EADI NORDIC 2017 provides a public forum for academic exchange, reflection and debate on pressing global and developmental questions. We invite scholars, policymakers and practitioners to engage in new approaches to understand global challenges and reflect on paths forward. In order to keep yourself updated on all issues concerning the EADI NORDIC 2017, we recommend you to subscribe to our conference eNewsletter. This website will be updated regularly, too. What is the process for submitting papers? 3. Upload of final paper for accepted papers. How to use the Online Submission Tool? Create a new Account: You have to create a user account in order to use any facilities of the Online Submission Tool. Go to the Online Submission Tool and follow the “Register New” link. After filling in the required fields of the web form, a confirmation e-mail will be sent to you with your account details. You do not have to create a new user account for each paper you submit. The same user account can be used for multiple submissions. Login to the Online Submission System: Depending on the phase of the submission and review process you will see different options after logging in. If you have already submitted papers, you can always access the list with your submissions and see their status. If you have forgotten your password a new one can be obtained through the “Forgotten your password?” link. Submit a New Contribution: Select “Your Submissions” and select the Working Group Session or Panel where you want to submit your abstract. You will also have the possibility to update your submission and upload newer versions until the submission deadline. A paper upload facility will be available after acceptance of your abstract. A number will be assigned to your submission, please use this number for further reference. Paper Upload: Login to your Conftool account, then go to “Your submissions”, select the submission where you would like to upload a paper. On the right navigation, click on “Upload”. Then you can upload your paper. Update Contribution Details: Until the submission deadline, you can update your contribution details, upload new versions of the contribution, or withdraw the contribution. The last uploaded version at the time of the submission deadline will be considered for review, unless the contribution is withdrawn. What are the guidelines for formatting final papers? Furthermore, a title page and and abstract page need to be included as the first two pages of your finished paper. Please download the EADI NORDIC 2017 Paper Cover Page and add it to your document, before uploading the finished paper to ConfTool. Login to your Conftool account, then go to “Your submissions”, select the submission where you would like to upload a paper. On the right navigation, click on “Upload”. Then you can upload your paper. Yes. You have to register in advance if you wish to participate at all sessions and panels of the conference. To register, please follow this link to the registration form. Information on the rates can be found here. Please note: In order to access the programme and all abstracts you will also have to register with our Conference Management Software. This is compulsory for all presenters, authors, chairs and panel convenors. You can now register for the EADI NORDIC Conference 2017 via this Registration Tool! Fees will increase by NOK 500 for registrations after 15 June 2017. Registration fee includes three lunches, two receptions and coffee breaks. 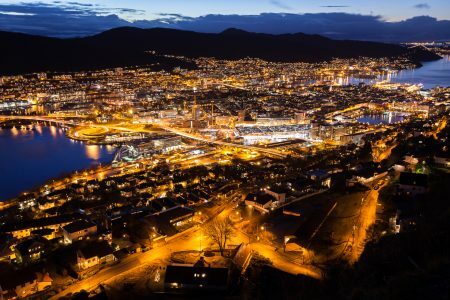 The Conference Dinner will take place on Mount Fløyen, one of Bergen’s seven city mountains, and costs NOK 900. We offer accommodation at Scandic Bergen City from NOK 1040 per night, which you can also book via the registration link. I have already registered and paid, why do I still need to register in Conftool? In order to access the full programme and all abstracts we kindly ask you to register in our Conference Management Software, Conftool. Of course, there is no additional charge! Registration in Conftool is compulsory for all confirmed authors, speakers and chairs. Will the travel costs and registration expenses be reimbursed? All bursaries have been awarded. No further funds are available. Will my paper be published? 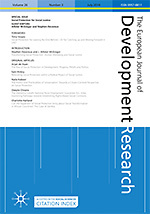 The European Journal of Development Research (EJDR) is a multi-disciplinary journal that seeks to broaden our understanding of the processes that advance or impede human development, whether from a political, economic, sociological or anthropological perspective. It is published five times a year by Palgrave/McMillan on behalf of EADI. The EDJR is recognized by the International Social Science Citation Index. Chief Editor is Spencer Henson, University of Guelph, Canada and Institute of Development Studies, UK. What are publication possibilities at EADI? Senior Economic Affairs Officer at the United Nations Economic Commission for Africa. We cordially invite individual paper presenters and panel organisers to consider these products as a possibility to publish conference papers, as an outcome of panels and working group sessions. The editors of both publications are happy to answer your questions. No need to put all locations separately into your search engine. We have done it for you! See our EADI NORDIC 2017 Map. Can I get a confirmation letter in order to apply for a visa? Yes, if your are a registered and confirmed presenter or participant. In order to receive a letter to apply for a visa, you need to make sure to create an account on ConfTool. As an author of a paper or as a presenter you will already have an account. When creating an account you will be asked to enter your name, contact data and passport number. Only if all this information is provided, we will be able to issue a letter for you! Bergen is located on the west coast of Norway, quite distant from Oslo in the east (464 km!). While a flight from Oslo takes less than an hour, going by train or by car you will need more than 6 hours. Mind that for cars there is an electronic toll paying system (Autopass) used on Norwegian highways. Let’s assume you are somewhere else than in Norway. Most probably, you will first arrive by airplane. There is a Bergen Airport Bus shuttling every 10 (15 on Saturdays; different frequency on Sundays) minutes between airport and city centre. You can purchase a return ticket online (students are granted discounts!). Another option is to take a taxi. The stand is located just outside the terminal. 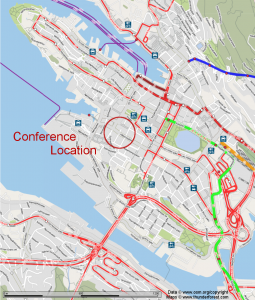 If you prefer renting a car, please have a look on the official website for Bergen and the region, where they provide information and recommendations for transport alternatives. How do I get around in Bergen? Bergen is one of the smallest European cities to have both tram and trolleybus (electric urban transport system) simultaneously. Hence, you will benefit a lot from using the public transport. Consider purchasing a Bergen Card in order to travel for free with Skyss’ busses and Bergen Light Railway in the city centre and the entire Bergen region. 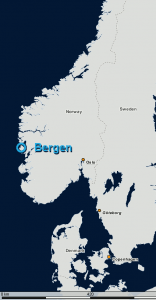 Mind, that Bergen Card does NOT include transportation from or to the airport! Of course, the conference itself will offer numerous opportunities for networking, sharing ideas, discussing new trends. Beyond that, we also have planned some exciting activities for you to socialise more leisurely and experience beautiful Bergen at the same time. You can register for all of these activities through the registration form. Want to explore Bergen while you are here? Join us! In addition, we are delighted that Bergen municipality will welcome our conference participants with a reception at the magnificent medieval Haakon's Hall. This reception takes place on Monday 21 August at 7:30 pm. Participation is free. The Conference Dinner will take place Tuesday 22 August at 8 pm on Mount Fløyen, one of Bergen’s seven city mountains, and costs NOK 900. What climate can I expect? In Bergen, benefiting from the warming effect of the Gulf Stream, you will find mild weather compared to the rest of Norway. Temperatures can reach up to 17°C/ 63°F in August. However, don’t miss to bring your umbrella and a rain jacket: Due to rain clouds regularly being trapped by the surrounding mountains, Bergen is wetter than other areas. The currency used is named Norwegian Krone (NOK). Foreign currency is not accepted everywhere, but credit cards are widely accepted. To roughly estimate the exchange rate, it could help to divide prices by 10 (for EUR/GDP/USD). View current exchange rates for Euro, Pound Sterling and US Dollar at Norway’s central bank. Norway uses Central European Summer Time like many European countries – two hours ahead of Coordinated Universal Time (UTC+2). That’s basically up to you! As restaurants, hotels and taxi drivers charge with a service fee already included, no tip is expected. In restaurants and bars, you can optionally tip an extra 5-10% if you wish to express your satisfaction. If you’re overwhelmed by the service, you can of course tip more or express it by other measures. Where can I get general tourist information? Bergen provides plenty of information for visitors on its official tourism website. If you wonder what other things you can do, since you have made it so far, the website lists up quite a few activities, among which you should definitely try the sightseeing by boat. Don’t miss on Hardangerfjord with its waterfall Vøringsfossen or the glacier Folgefonna. You can also check out our photo gallery of Bergen.